Sorry for the late reply but I’ll try and answer some of these questions. As to butterfly eggs arriving too soon: When I was in my high school classroom, I don’t think I ever ordered my eggs so I wanted to see how the process might work. Last year I ordered some eggs to see how the problematic procuring eggs might be. The manual refers you to the fastplant web site where there is a ton of information about the butterflies and the plants. As described in the manual and on the fastplant website, I like to have a “nursery” ready for the eggs arrival. A “nursery” for me is an 8 oz. deli container filled with artificial soil (seed starting mix) and planted with more than 100 seeds from a brassica species. I normally had so many fastplant seeds left over that I generally used those but last year I was buying seeds like others so instead, I went down to the local health/natural foods grocery and picked up some broccoli seeds in the bulk seed section (for sprouting). I have found chinese cabbage and cabbage seeds in these bins. These seeds are not quite as quick as fastplants but they make fine nursery stock for the butterflies. Of course the eggs arrived before I was ready. Now, I don’t talk a whole lot about this but you can put the eggs in the refrigerator for a couple of days to slow things down if you’d like. What I don’t know is how long you can keep them there and what the mortality is if you keep them too long—sounds like an experiment. I imagine that if you keep them from drying out you can do 3-5 days but like I said you should test this when you have lots of eggs after you have raised a generation of butterflies. So I put them in the fridge and quickly planted my “nursery”. I knew it would take a day or two or three for the eggs to hatch (couldn’t be sure) so I waited until I had some plants germinating. The broccoli took longer than fastplants but you can see that some of the seed is germinated and plants are showing the cotyledons. Notice that I have added the wax paper strips with the eggs at this point. Each eggs strip represented one unit from the supplier. I purchased two. Here we are a few days later. Remember the broccoli a bit slower. The eggs have hatched, though not as many as I had hoped. You can see that the cotyledons are being eaten, you can see tiny specks of frass but what you probably can’t see is any larvae. I find they are too small to handle at this stage so I generally wait until they are bigger and have consumed most of the foliage then I move them to grocery store food. Those are brussel sprouts in the deli containers. There are a number of small holes in the deli containers to allow water vapor to escape and the paper towels on the bottom are moistened very slightly. They paper towels are changed daily or every other day. There are about 50 larvae in these chambers getting ready to tranfer to the cabbage. There is about 3 to 4 larvae on each half of a brussel sprout. To avoid pesticides the outside leaves of the sprouts were removed. Yes those are spiked handles for eating corn on the cob…. Here’s a close-up. The larvae not on the brussel sprouts are getting ready to molt to the next instar. The half cabbages are used to finish out the larval phase of the life cycle. Large 4th instar larvae are place on the cabbage head. Note there is a nail sticking vertically out of the small boards used as platforms and that the cabbage is slanted so that the cut face is tilted down so that the frass will not contaminate the cabbage. These cabbages are placed in the paper box you see in the upper right. I put on the lid to keep the smell in and the critters in. They finish out their life cycle and then pupate within the box. You’ll find the pupa/chrysalis all over the inside of the box. For the energy dynamics lab–instead of the cabbages you would be transferring over to growing 14-day old fastplants. Tom and others have talked about costs and space. The lab is purposely does not prescribe any particular set up—mostly because it can be different in every class. However, this system was suggested because it can be relatively cheap–in fact, very cheap money wise. Space wise is different. It does requires some space but not all that much. I had about 100 to 125 students most years and I fit all my classes plants into a light rack system that you can see in this image. There are two rows of 4 trays and generally I could get one class worth of plants in each tray. There are two 6 bulb fluorescent fixtures. Note that the plants here are growing in bottle containers. (no cost for the containers, got the bottles from the recycle bins, they are 20 oz. coke bottles.) Each tray can hold 24 bottle systems (20oz.) or about 9 of the deli systems. Some deli containers I’m putting together to plant later today or tomorrow. I haven’t decided whether or not to paint them black to reduce algae growth. The little cups are “portion cups” 1.25 oz. I got these from Party City 100/$3.50 You can order them via the web as well. 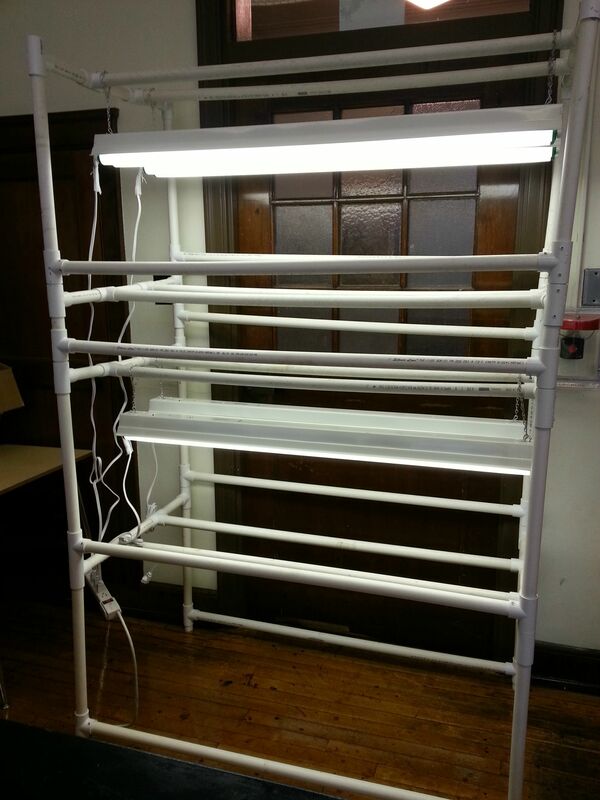 The light rack system is kind of the ultimate plant system (My wife and I both have one of these) They are expensive to purchase (3-4 hundred) and the 6 bulb fluorescent fixtures are hard to find–plus there is the wiring etc. However, school electricians in my experience are usually willing to set this up for you. (of course I live in the midwest). I don’t often recommend these for teachers because of the expense though they do help to save space. Instead I recommend the light box system. From the Fastplant web site. These can be constructed for about $15-18 each. I’ve priced the materials closer to $20 and have purchased them for $12. (The crates are highly variable in price, right now because I’m in a college town they are very cheap (<$5 each), the electrical system is about $7 to $10. One of these will almost work for a class (not for class of 30) as they hold almost as much as one of my trays. You can get 15 of the bottle systems or 7 of the deli systems in one of these. The modularity makes them easier to move around the room and perhaps find small unused nooks. Like wise they could be stacked in a bookcase of some sort. Over the years, I’ve made my own light racks, purchased them and built light boxes out of everything from milk crates, to 5 gal. buckets to paper boxes. In my experience the most expensive part of the set-up is the light system but still affordable. There is the artificial soil mix, the braided nylon wicking material, and the fertilizer (and of course the seed) to add to the cost as well. I usually by the soil by the large sack for about $35 which lasts for at least 3 to 4 years as does the fertilizer that runs about $7. I’m setting a couple of my former students up with complete systems (1 light box, seeds, deli growing containers and supplies) this weekend. I don’t anticipate spending more than $25 per setup. BTW, I usually round up all the materials myself but I often required my students to obtain their own deli containers or their own bottles–part of doing science. Light stands can be built for fairly cheap. I had my students make me one out of PVC, and saved a lot of money! The upper part is even built to accommodate hydroponics systems. I’d love to try butterflies this year!